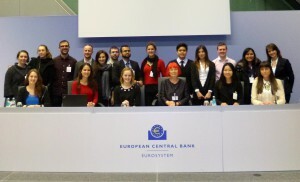 On Thursday, January 14th our students of the Master Programme European and European Legal Studies visited the European Central Bank (ECB) in Frankfurt/Main. After an early morning departure in Hamburg the group arrived in Frankfurt at 10am to hear a series of talks on monetary policy at ECB’s headquarters. The first lecture addressed the future of (European) central banking, highlighting traditional tasks and new responsibilities. This was followed up by a background talk with Sabine Lautenschläger, member of the Executive Board of the ECB. Her presentation was entitled: “The importance of a European Supervisor – Achievements after one year” and addressed the newly created Single Supervisory Mechanism. In the afternoon the lecture programme was rounded out by two further presentations on monetary policy strategy and implementation and the international role of the euro, as a reserve currency and its role in international trade. The talks offered our students a valuable complement to their course work, as well as the opportunity to pose their questions and gain great insight in to the work of the ECB.